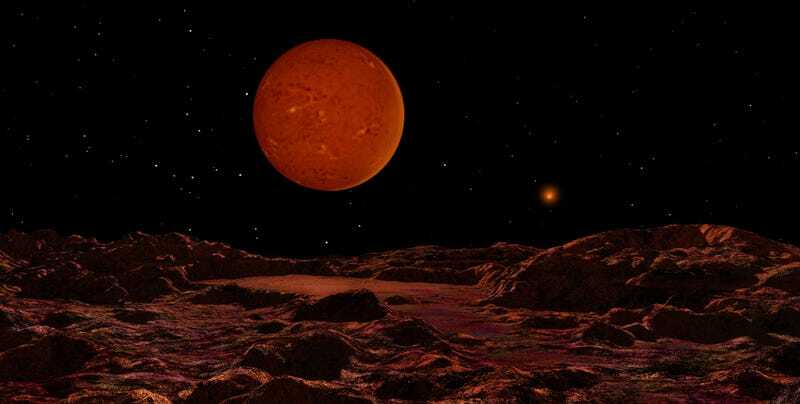 Brown dwarfs are not quite stars and not quite planets. They are much larger than gas giant planets but fall just short of being large enough to trigger hydrogen fusion. Thus the name "brown dwarf," because they are dark bodies, not generating enough energy to glow like a star. One brown dwarf with the catchy name ULAS J222711-004547 seemed to be much redder than a brown dwarf ought to be. The reason turned out to be the presence of a very thick layer of clouds in its upper atmosphere. "These are not the type of clouds that we are used to seeing on earth," said Federico Marocco, of the University of Hertfordshire, who led the team that studied the object. "The thick clouds on this particular brown dwarf are mostly made of mineral dust, like enstatite and corundum. Not only have we been able to infer their presence, but we have also been able to estimate the size of the dust grains in the clouds." The size of the grains of dust is important. It is what determines the color of the brown dwarf's sky. The clouds of giant planets like Jupiter and Saturn include ammonia and hydrogen sulfide as well as water vapor. But the brown dwarf's atmosphere is much hotter. While it includes water vapor, methane and probably some ammonia it is dominated by particles of clay-like minerals. "Being one of the reddest brown dwarfs ever observed," said Dr Avril Day-Jones, of the University of Hertfordshire's Centre for Astrophysics Research, "ULAS J222711-004547 makes an ideal target for multiple observations to understand how the weather is in such an extreme atmosphere." "By studying the composition and variability in luminosity and colors of objects like this, we can understand how the weather works on brown dwarfs and how it links to other giant planets."